I'm not sure that, in the Brooklyn Nets' seventh home season, that helps give "Brooklyn a soul," as boosters like Bruce Ratner once said, but it does mean savvy basketball fans and bandwagon locals respect a team that rebuilds smart, plays hard, and wins, as the Nets have been doing. 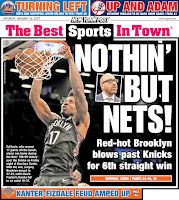 And it means the Nets dominate the back of the tabloids. 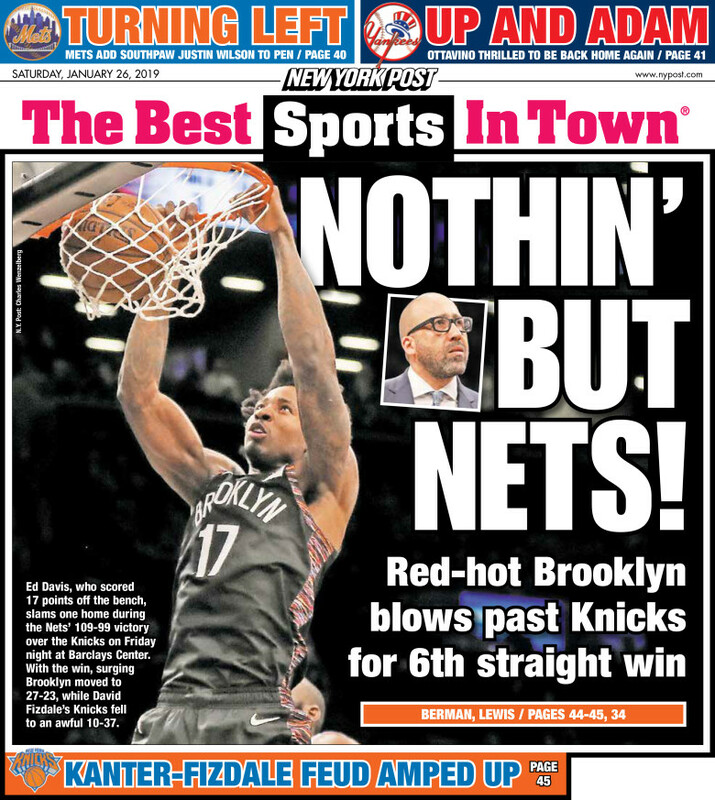 The Nets Are Looking Really Good, Even From London, wrote former New York Times journalist (and former Prospect Heights resident) Peter S. Goodman for his former paper 1/24/19, describing how he and his 7-year-old son were following "one exhilarating victory after another for our suddenly mighty Brooklyn Nets." My embrace of the Nets began seven years ago when the Knicks — the only team I had ever rooted for — shunned a gift from the basketball gods by letting Jeremy Lin leave town. It was the final indignity after years of atrocious basketball. I dumped my Knicks season tickets and adopted the fledgling club whose arena had just risen over my Brooklyn neighborhood. Of course he didn't drop the Nets after they acquired and then traded away the oft-injured Lin. ... I fought through a sense of exile in the slick, new Barclays Center, which was full of fans for whom the game itself appeared peripheral to the cool Brooklyn food, the dancing during timeouts, and whatever fascinating things were happening on their phones. And now, as he describes it, the Nets are rebuilding right, and he's feeling fandom. Not everyone in Prospect Heights can be so sanguine about the Barclays Center, or the Nets. But it's not unlikely that more Brooklynites will follow a winning, well-constructed team to a transit-accessible (or walking-accessible) arena. Caller @ 10:15: "Listen, I've been a Nets fan since they came in 2012. The only beef I have is they promised high-paying jobs for the community, they didn't follow through on that. The team is a good team... I think they're good for BK."